Favorite Summer Beauty Products- My Recommendations! These are my favorite beauty products for summer and the products that I would recommend! Review of the unisex hair care line VERB. New Beauty Finds from March 2012: Wrinkle Prevention Pillow, Model Mirror and more..
What’s your favorite Spring trend this year? I have been seeing a lot of braids, neons and bright colors, and animal print is always a trend for spring and summer. So what did I do? I combined three trends: braids, bright colors and animal print and spiced up my normal hair and nail routine. Instead of the normal ponytail, I decided to create a ponytail, braid my ponytail and loosen it up for a different braided type of look. I was inspired by Katniss’ braids in the Hunger Games. She sports a variety of different braids in the new Hunger games movie. For my nails, I took one of my favorite bright colors of the season, orange , and KISS leopard print nail decals and created this fun nail look. If you enjoyed this post and want to see more make sure you subscribe! Only a few days left to enter my giveaway for Mood Magic Lipsticks.For extra entries in this contest, simply re-post on facebook or tweet the post and tell me you did and I will enter you twice. I have two sets of shampoo and conditioner, both are my current favorites because they have left my hair softer, silkier and more manageable. The first is Philip Kingsley’s Moisture Extreme Shampoo and Conditioner. This stuff is serious business. I can tell almost immediately that it is helping to mend my split ends and dry strands. The conditioner makes my hair immediately silky. I leave the conditioner on for an extra 5 minutes or so to make my hair super soft. Both shampoo and conditioner are in the $20 range. “Invigorates and feeds from root to tip with a fresh tingle for bouncy, shiny, radiant hair that’s noticeably more resilient with every use. With natural Eucalyptus and peppermint oil, this formula stimulates the scalp with a cool, tingling sensation. Massaging your scalp encourages circulation, which will wake-up healthier-looking new growth. Hope this helps if you are also looking for a really good moisture rich shampoo and conditioning duo. Thanks for reading!! Who’s watching the Oscar’s tonight?!?? I can’t wait. I will definitely be reporting on the beauty and style I see on the red carpet. FTC -some of these products were sent from PR for consideration. I was not paid for this post and I only write about products I am 100 % in love with. Beauty and Fragrance for Valentines Day! Hey Guys, You may not expect to receive anything for Valentine’s Day this year, but here are some things I’ve come across in the last month that would make a great gift , (even if you have to buy it for yourself). This is also sort of my January/February favorites in Beauty. The first is one has to be my favorite scent right now. It is the fragrance, “After my own heart” by Ineke. http://ineke.com/catalog/product_info.php?cPath=23&products_id=28 I can’t even begin to describe how much I love this scent, especially this time of year. It smells like sweet lilacs. It’s notes are Bergamot, Raspberry, Crisp Green Foliage, Lilac Sandlewood, Heliotrope and Musk. IT SMELLS SO GOOD!! The second gift item is a home fragrance. It is the Reed Diffuser by Alora Ambiance. These make a great gift for someone or for yourself because I don’t know who wouldn’t like something to make their home smell nicer. These are so fragrant, and look very nice as decoration too!! Alora Ambiance is actually based on of Minneapolis, right here! Go check out their fragrances if you have not yet! http://www.aloraambiance.com/ I also hear the fragrance can linger in your home for up to 6 months!! The third recommendation is a must have hair item in my own personal opinion. 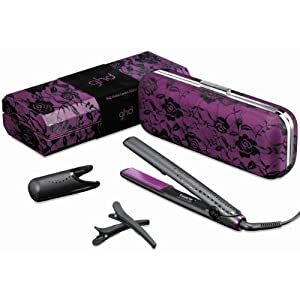 It is the GHD Limited Edition Pink Orchid Flat Iron. I think my all time favorite flat Iron I have ever used is the GHD. It just always does the trick, is very sturdy, and heats up in seconds. I LOVE IT!! And, take a look at this cute limited edition one you can get at http://www.sephora.com/ It has purple plates! It comes in this sturdy clutch like case to keep it in or use for makeup or other products when traveling. It’s perfect for a special Valentines Day gift for your teenage daughter, niece, friend, or definitely yourself too! Hope you enjoyed these Valentines Day Gift Ideas. Subscribe over in the right hand column if you liked this post and want to be in the know every time I post something new! Some of these products were provided from PR for possible review. I was not paid for this post and I only share products and items I would 100 % reccomend to you all!! Hi Everyone! If you’re like me, you have quite a few different hair styling products. Maybe a curling iron, flat iron, blow dryer, etc. And, there is not really a “cute” way to store these besides setting them on your bathroom counter and creating a mess of cords. I found this holder, “Cool Care”, by AmericanBeauty and it is the perfect way to organize, and protect myself from the heat of these tools. I love that this holder comes in two styles, one for your bathroom counter top or one that you can mount in the wall. These can fit most hairdryers, curling irons, and hair straighteners. The names of the game here are convenience, safety, and functionality. These are not cute, or “pretty” but they have made my bathroom counter top look a whole lot more organized, and made reaching for my blowdryer and straightener a lot easier. I never again have to worry about the heat from the tools melting something on my counter top. You can look at all these products at: http://www.americanbeauty.ws/CoolCare-Curling-Iron-Flat-Iron-Wall-Mounted-Safety-Stainless-Steel.html I really enjoy sharing with all of you my “beauty finds” and I’m dying to know what you’ve found lately!? I received these products from the company for consideration. I was not paid for this review, and my opinions are always completely honest. I would only share with you all the things I REALLY love. Hey Guys! American Idol starts up tonight. I don't watch a lot of TV but when I do, I love to watch reality singing shows, award shows, or anything dealing with style and beauty. One of the main reasons I love watching American Idol is Jennifer Lopez. I used to love it for Simon Cowell smart and funny comments...but now, it's fun to see what Ms. Lopez will be wearing, or how she will have her hair and make up. She's a style inspiration for sure!!! She looks absolutely gorgeous all the time and is always switching up her hair and make up style, it never seems the same one week to the next. So, will you be watching American Idol tonight? And, if so what is your favorite part of the show? ?